Neuronal polarity describes the spatial, morphological, structural, and functional differentiations that occur in neurons during early development that results in the formation of a single axon and multiple dendrites. Axons and dendrites are responsible for directional signaling in neurons - receiving, processing, and transmitting information from the postsynaptic dendrites to the axon of the postsynaptic neuron. The majority of excitatory inputs at the dendrites occur at dendritic spines. Polarization of the neuron begins with the loss of the symmetric shape of a round newborn neuron via formation of minor neurites1-4. 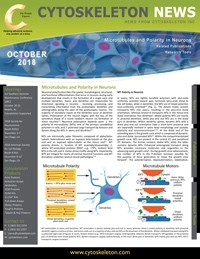 Neuronal polarization depends upon: 1. the polarity of microtubules (MTs), one of the primary cytoskeletal polymers in cells, and 2. polarized cargo transport by kinesins and dynein along the MTs in axons and dendrites4,5. MTs are intrinsically polar filaments composed of alpha/beta-tubulin heterodimers with an exposed beta-tubulin at the plus end and an exposed alpha-tubulin at the minus end5-7. MT polarity directs: 1. location of MT assembly/disassembly; 2. where MT-associated proteins (MAPs; e.g., +TIPs, motors) bind MTs in the cell; and 3. motor-driven traffic along MTs. Importantly, MTs are integral for nearly all normal neuronal functions and MT disruption underlies several neural pathologies7-10. In axons, MTs are tightly bundled polymers with plus-ends uniformly oriented toward axon terminals (plus-ends distal to the cell body), while in dendrites, the MTs are of mixed polarities (non-uniformly oriented)11 (Fig. 1). The dynein motor protein transports MTs into axons, resulting in the plus-end distal orientation, whereas kinesin-6 transports MTs in the minus-end distal orientation into dendrites5. Mixed polarity MTs are mainly in proximal dendrites, while plus-end out MTs are in the distal part of dendrites. Within dendritic spines, dynamic MTs with a distal plus-end out orientation have a short-term presence and are reportedly involved in spine head morphology and synaptic plasticity and neurotransmission12,13. At the distal end of the extending axon is the growth cone which is composed of dynamic, plus-end distal, tyrosinated MTs14. Within the compartmentalized growth cone, MTs are present in the central (C) and peripheral (P) domains. The former contains stable MTs, while the latter contains dynamic MTs. Enhanced anterograde transport along MTs provides necessary molecules and organelles to the advancing axon growth cone4. During growth cone advancement, the number of MTs in the P-domain increases, possibly for the purpose of force generation to move the growth cone forward4. The polymerization, depolymerization, stabilization, and destabilization of MTs in the P-domain are subject to many regulatory forces, including the coupling of dynamic MTs with the actin cytoskeleton, Rac1-mediated activation of the oncoprotein 18/stathmin, and PI3K-mediated activation of assorted MAPs and +TIPs4. P-domain MTs are essential for membrane insertion, an important process in axon and dendrite growth. Through membrane insertion, tension on the expanding surface area of the existing membrane is reduced. Without this reduction in tension, membrane protrusion, advancement of the growth cone, and continued neuronal polarization could not occur. Stabilization of P-domain MTs allows transport of signaling molecules along these MTs and the required mechanical forces are generated in the growth cone. Stabilized P-domain MTs coordinate actin dynamics and actin-mediated force generation during membrane insertion and growth cone steering and growth4. Figure 1: MT polarization in axons and dendrites. MT orientation is almost entirely plus-end out in axons, whereas there is mixed polarity in dendrites with proximal dendritic regions a mixture of plus- and minus-ends out vs a majority of plus-end out MTs in the distal parts of the dendrite. Motor-mediated transport along MTs is polarized. In axons, kinesin motors (e.g., KIF5) transport cargoes anterogradely, whereas dynein transports retrogradely. In the proximal part of dendrites with mixed polarity MTs, dynein transports cargoes bidirectionally. In the more distal part of dendrites with mainly plus-end out MTs, KIF17 transports cargoes away from the cell body. MTs in axons vs dendrites are polarized in their post-translational modifications (PTMs). In dendrites, mixed polarity MTs are modified by tyrosination, acetylation, and short-chain glutamylation with the majority of minus-end out MTs stable and acetylated, whereas plus-end out MTs are tyrosinated and dynamic15. Axonal (plus-end out) MTs are modified by long-chain glutamylation, acetylation, polyamination, detyrosination, and Δ-2 tubulin14. Within axons and dendrites, MTs are the tracks upon which cargoes are transported either anterogradely or retrogradely by kinesins and dynein motor proteins (Fig. 1). At least in the case of the kinesins, PTMs affect the binding preference of kinesins for specifically modified MTs. For example, kinesin-1 is a plus-end-directed motor, which means it interacts preferentially with acetylated MTs. This results in kinesin-1 exiting dendrites and entering axons. Conversely, kinesin-3 favors tyrosinated MTs, allowing this kinesin motor to function in both axons and dendrites15. Kinesin-mediated (e.g., kinesin-1/KIF5 and kinesin-2/KIF17) transport occurs along uniformly oriented, plus-end out MTs, while dynein mediates transport along mixed polarity MTs7,16,17. The mixed polarity MTs in proximal dendrites support bidirectional dynein-mediated cargo transport, while plus-end out MTs in the distal part of dendrites utilize KIF17-mediated transport17 (Fig. 1). KIF5 and KIF17 can transport cargo already localized to the dendrites; moreover, taxol-stabilized MTs enable KIF5-mediated cargo transport into dendrites17. Neuronal polarity is essential for the proper development, growth, and physiology of neurons. Within neurons, MT and motor protein polarities are required for establishing and maintaining neuronal polarity. However, unanswered questions remain: 1. Why are some cytoplasmic molecules in axons but not dendrites; 2. How do MAPs become compartmentalized differently in each type of neurite; 3. Why does a neuron have a single axon but multiple dendrites?5. Scientists at Cytoskeleton, Inc. offer reagents to assist researchers in answering these questions, as well as many others regarding MT functions in the central nervous system. Useful reagents include Signal-Seeker Enrichment kits for quantifying levels of endogenous PTMs such as acetylation, tyrosine phosphorylation, ubiquitination, and SUMOylation, as well as purified cytoskeletal proteins (e.g., actins, tubulins, small GTPases, kinesin and dynein motors) and functional assay kits to measure the activities of these same proteins. Caceres A. et al. 2012. Neuronal polarity: demarcation, growth and commitment. Curr. Opin. Cell Biol. 24, 547-553. Kapitein L.C. and Hoogenraad C.C. 2011. Which way to go? Cytoskeletal organization and polarized transport in neurons. Mol. Cell. Neurosci. 46, 9-20. Kapitein L.C. and Hoogenraad C.C. 2015. Building the neuronal microtubule cytoskeleton. Neuron. 87, 492-506. Schelski M. and Bradke F. 2017. Neuronal polarization: From spatiotemporal signaling to cytoskeletal dynamics. Mol. Cell. Neurosci. 84, 11-28. Baas P.W. and Lin S. 2011. Hooks and comets: The story of microtubule polarity orientation in the neuron. Dev. Neurobiol. 71, 403-418. Voelzmann A. et al. 2016. A conceptual view at microtubule plus end dynamics in neuronal axons. Brain Res. Bull. 126, 226-237. Chakraborti S. et al. 2016. The emerging role of the tubulin code: From the tubulin molecule to neuronal function and disease. Cytoskeleton. 73, 521-550. Tischfield M.A. et al. 2011. Phenotypic spectrum of the tubulin-related disorders and functional implications of disease-causing mutations. Curr. Opin. Genet. Dev. 21, 286-294. Neumann B. and Hilliar M.A. 2014. Loss of MEC-17 leads to microtubule instability and axonal degeneration. Cell Rep. 6, 93-103. Coles C.H. and Bradke F. 2015. Coordinating neuronal actin-microtubule dynamics. Curr. Biol. 25, R677-R691. Hu X. et al. 2008. Activity-dependent dynamic microtubule invasion of dendritic spines. J. Neurosci. 28, 13094-13105. Jaworski J. et al. 2009. Dynamic microtubules regulate dendritic spine morphology and synaptic plasticity. Neuron. 61, 85-100. Park J.H. and Roll-Mecak A. 2018. The tubulin code in neuronal polarity. Curr. Opin. Neurobiol. 51, 95-102. Tas R.P. et al. 2017. Differentiation between oppositely oriented microtubules controls polarized neuronal transport. Neuron. 96, 1264-1271. Prokop A. 2013. The intricate relationship between microtubules and their associated motor proteins during axon growth and maintenance. Neural Dev. 8, 17. Kapitein L.C. et al. 2010. Mixed microtubules steer dynein-driven cargo transport into dendrites. Curr. Biol. 20, 290-299.